As the global financial crisis now enters its seventh year, it is time to start asking difficult questions about the right priorities for popular protest if we want to realise a truly united voice of the world’s people. There can be no genuine revolution in a moral or global sense until the critical needs of the extreme poor are prioritised and upheld, which will require mass mobilisations in the streets like we have never seen before. At the onset of 2014, many people are now anticipating the prospect of a ‘global revolution’. The intense revolutionary fervour of 2011 may have dissipated in North America and much of Western Europe in the past couple of years, but a new geography of protest continues to shift and transmute in different countries and world regions - the million people on the streets of Brazil in June last year; the earlier defence of the commons in Istanbul's Taksim Gezi Park; the indigenous uprising and student protests across Canada; the Ukraine demonstrations that are still under way. There is no way of predicting where a mass protest movement will kick off next or what form it will take, but analysts expect that an even larger-scale version of an Occupy Wall Street-type movement will emerge in 2014. The conditions for a truly global political awakening are firmly in place, and few can believe in the politician’s rhetoric about the world economy sorting out its problems during the year ahead. Wealth and income inequalities continue to spiral out of control, increasingly to the benefit of the 1% (or indeed the 0.001%). Austerity policies pushed by governments on both sides of the Atlantic continue to threaten the social gains made since the Second World War, which is deepening social divisions and creating a new situation of desperately poor and hungry people in Britain, America and many so-called wealthy countries. And there is no shortage of analysis about the structural crisis of our political and economic systems, from chronic unemployment and falling real incomes to corporate-captured representative democracies and Orwellian state controls. At the same time, governments remain committed to the paradigm of endless growth for its own sake, and are nearly all beholden to the interests of giant energy corporations that are determined to burn more fossil fuels than the planet can absorb without becoming unliveable. Not to mention the escalation of climate and ecological disasters, dwindling oil reserves, the risk of food shortages and further food price volatility, or even the prospect of global terrorism. Hence the growing understanding among everyday people that we are in the midst of a crisis of civilization, and we cannot rely on our existing government administrations to affect a necessary transformation of the international political and economic order. As we continue along this chaotic and uncertain road, the very idea of social or political ‘revolution’ is taking on new and different meanings. A common understanding of the term is no longer limited to the revolutionary wave of actions of the 20th century, which were typically led by charismatic leaders and a strong ideology, and often involved the violent overthrow of state power (notwithstanding such heroic examples of non-violent political struggle as Gandhi, Luther King and Vaclav Havel). But now we have the examples of Occupy, the Arab Spring, the Taksim Square demonstrations and other mass protest movements that defy conventional explanation in their spontaneous and largely peaceful mobilisations, their leaderless structures and practice of horizontal democracy, as well as their disavowal of traditional left/right politics and ideologies or ‘isms’, such as socialism and communism. Since 2011 there is also much serious talk of a revolution of love and a collective awakening to our spiritual potential as human beings, as captured in the now-famous words of Russell Brand who advocates a “total revolution of consciousness and our entire social, political and economic systems”. Others speak of a revolution in our sense of self as ‘global citizens’, in which we equate our own interests with those of people anywhere in the world, and we no longer conform to a financialised vision of society in which we are forced to compete with everyone else as ‘others’. In short, a renewed sense of idealism and hope is everywhere being felt for a new society to be built from within the existing one, and for a revolution in every sense of the word – in our values, our imaginations, our lifestyles and our social relations, as well as in our political and economic structures. What still isn’t clear is how the growing call for revolutionary change and new economic models can be realised on a truly international basis, and for the common good of all people in all countries - not only for the citizens of individual nations (in particular within the most advanced economies). The new protest movements may draw on a concept of human rights that is necessarily international, and they may be driven by social networks and communications technology that is shared beyond national borders, but their various concerns and demands are still generally of a domestic and country-specific nature. Following the artful state repression of Occupy Wall Street, the vision of a collectively organised alternative to neoliberal politics is too often lost in a fight for or against individual reforms, while the Occupy movement as a whole has become increasingly atomised and fragmented. The Arab Spring is fast fading in memory, as exemplified by the political chaos and recent crackdown on popular dissent in Egypt. And there is little evidence of a shared agenda for change that can unify citizens of the richest and poorest nations on a common platform, one that recognises the need for global as well as national forms of redistribution as a pathway towards sharing the world rather than keeping it divided. This is not to say that realistic proposals for planetary change do not exist, as individuals and groups everywhere are discussing the necessary reforms and objectives for how the economy should be run democratically at all levels, from the local to global. 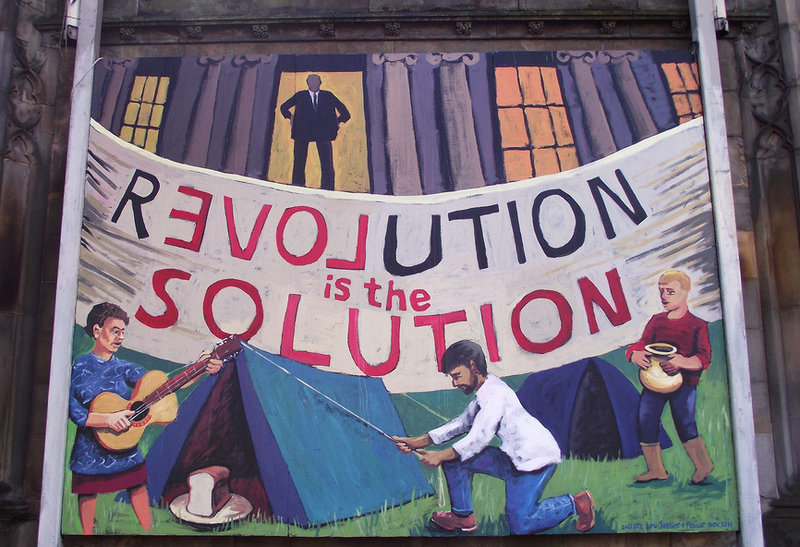 An abundance of enlightened thinking outlines the need for a ‘revolution’ in every aspect of our economic and political systems – a commons revolution, a food sovereignty revolution, a renewable energy revolution, the next American revolution – which altogether articulate an effective blueprint for a new and better world. But great uncertainty remains around how this crucial transformation of our lives can be effected when such immensely powerful forces of economic and political self-interest control the current world direction, combined with political apathy and disengagement among a vast swathe of the population. With the global financial and economic crisis now entering its seventh year, it is time to start asking some difficult questions about the right priorities for popular protest if we want to realise a truly united voice of the world’s people. It is inevitable that the gap between rich and poor will continue to increase in most countries, and the reality of poverty and hunger will worsen across the world – regardless of the distorted arguments by the World Bank and the Millennium Development Goals (MDGs) coterie at the UN. And as living standards decline for many middle-class families in developed countries, there is a risk that people will remain preoccupied with their own situations and solely national concerns, which is already where all the militant strength is being directed in European and U.S. protest movements. But there is no escaping the enormous disparities in wealth and income between rich OECD countries and the less developed nations, where millions of people face such extreme deprivation and food insecurity that at least 40,000 people needlessly die each day from poverty-related causes. There can be no genuine revolution in a moral or global sense until the critical needs of these voiceless poor are prioritised and upheld, which will require mass mobilisations in the streets like we have never seen before – not only predicated on redistributing resources from the 1% to the 99% within our own countries, but also centred on a shared demand for a fairer distribution of wealth, power and resources across the entire world. Perhaps that is where the true meaning of ‘global revolution’ begins, and it could be our greatest hope for a sustainable and just future in the coming year and beyond.